Not a fan. First off, I want to own that I am not a big fan of using sports analogies or examples to create engagement in the workplace. I think we often have too much “rah rah” motivational stuff leaving us feeling more depleted than motivated. A long drive. A few weeks ago, I had to drive about 4 hours across the open Canadian prairies so I went to the library and looked for a book CD to listen to during the drive. 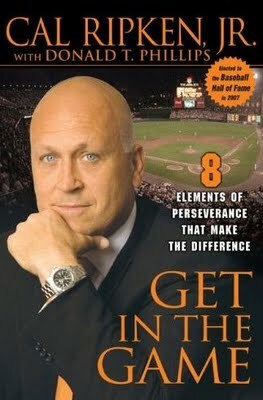 There wasn’t much selection so I finally grabbed a book by Cal Ripken, Jr., Get in the Game: 8 Elements of Perseverance That Make The Difference. 2632 Consecutive games. As a long standing Blue Jay’s fan I wasn’t sure I really wanted to read about a lifetime Baltimore Oriole but there wasn’t much available and Ripken played in 2632 consecutive games. A huge record compared to all other baseball players through the history of baseball. I thought there might be some nuggets for employee engagement from someone who showed up and did so well day after day after day. From reluctance to hearty endorsement. I went from reluctance to hearty endorsement of the book. Ripken was an engaged baseball player who showed up ready to play everyday and did play for 2632 games in a row. We can learn a lot from him about engagement. He went way above and beyond what was required. I was inspired and informed as I learned how he approached his work — learning everyday about the game and even calling pitches in many games from the shortstop position…something that is never really done in baseball. How do you help your organization “win” every day. Can you focus on your job one day at a time. Are your prepared to work everyday mentally, physically, emotionally, and spiritually. Does your preparation contribute to daily consistency? Are you adding value to your group, team, department, organization in every way you can?